The Temples at Abu Simbel are located in Southern Egypt, at the second cataract of the River Nile close to the Sudanese border. 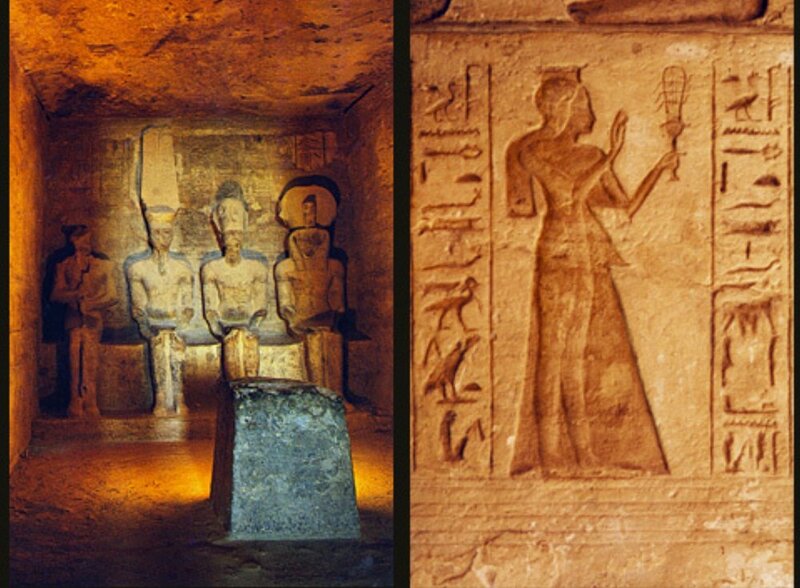 Rameses II chose the site because it was already sacred to Hathor, goddess of motherhood, joy and love. This act strengthened his divinity in the eyes of the ancient Egyptians. It encouraged them to believe that he, too, was a god. In ancient times, the Great Temple was known as “The Temple of Rameses-Meryamun,” which means Rameses, beloved by Amun. It stands 30m (98ft) tall and 35 (115ft) long. There is a biannual Sun Festival which is an ancient celebration that still takes place in Egypt today. On February 22nd and October 22nd, when the sun illuminates the back wall, the statues there are washed in sunlight. 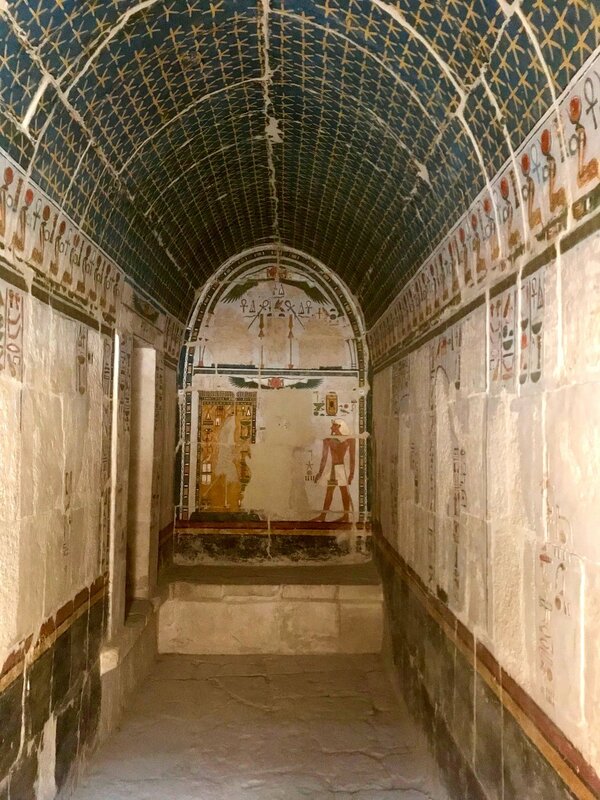 Although the Great Temple is also dedicated to Ptah, god of the Underworld, Ptah remains appropriately hidden from the sun. The modern day Sun Festival begins right before sunrise. Musicians and dancers are gathered to celebrate not just Rameses II and Nefertari. They also celebrate the remarkable technological and astronomical prowess exhibited by the ancient Egyptians. On the west bank of the Nile, 90 miles (145 km) north of Luxor, lies the Temple of Abydos near the small village of El ‘Araba el Madfuna. The Temple dates to around 3150 BC. This area, sacred to Osiris, was a powerful location to those who believed in the next world. 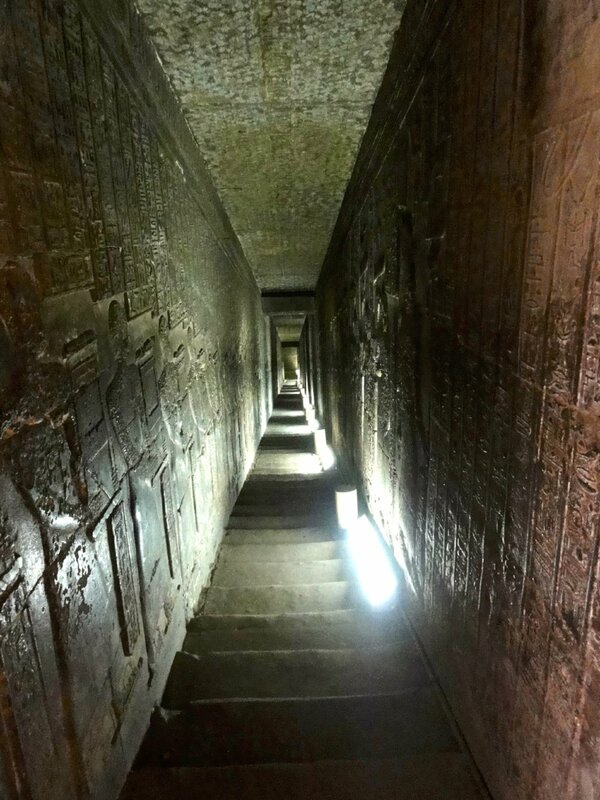 The ancient Egyptians said that at sunset, the area looked like a golden staircase leading to the afterlife. It was here that Osiris, after being killed by his brother Seth, returned to power. Seth had killed Osiris and scattered the pieces of his body all over Egypt. Osiris’ wife and sister, Isis, gathered the pieces and put them back together, thus restoring life to her husband. It was said that Abydos was where the final piece, his head, was buried, and so it was here that Osiris was brought back to life to become the judge of the dead and lord of the netherworld. As Seti I began the search for a location for his Temple, he was lead to a location north of Luxor in the bend of the River Nile. There he began to dig the foundation for his Temple. What he discovered was the Osirion, or the Ancient Temple of Osiris. 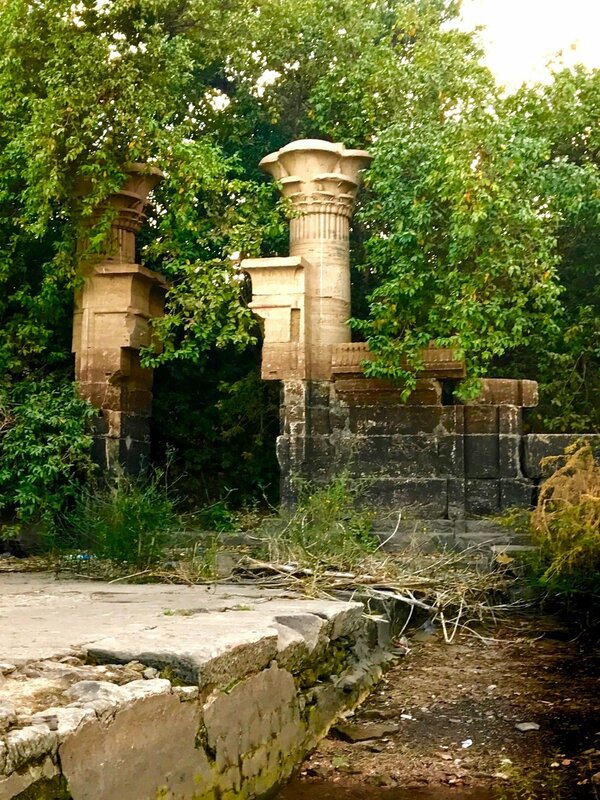 Whether he actually knew that the Osirion was there, perhaps we will never know, but upon finding this Ancient Temple in the path of his new Temple, he turned his new Temple to the left. It is the only Temple in Egypt that makes an ‘L’ turn. 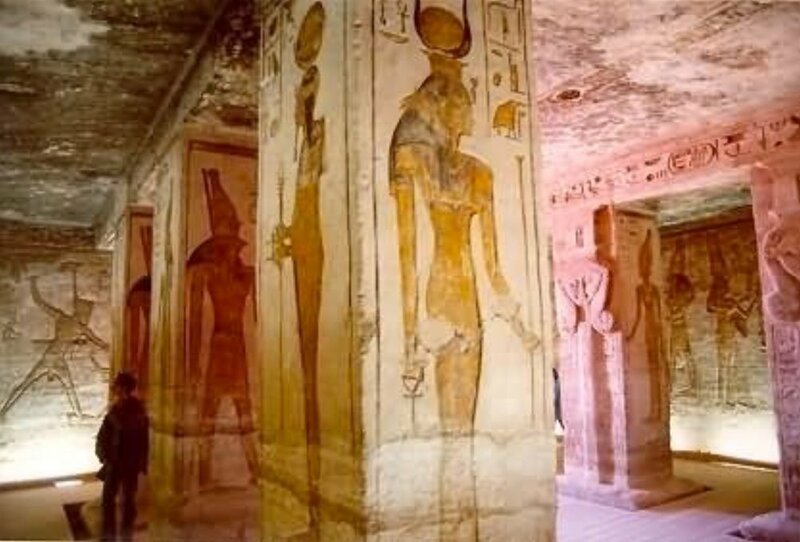 Seti’s temple was dedicated to Osiris, and consisted of a pylon, two open courts, two hypostyle halls, seven shrines, each to an important Egyptian deity (Horus, Isis, Osiris, Amun-Ra, Ra-Horakhty and Ptah) and one to Seti himself, a chapel dedicated to the different forms of the god Osiris, and several chambers to the south. There are murals on the walls of this Temple of the Djed pillar, a type of the World Tree, representing stability, continuity, and regeneration. The Festival of The Raising of the Djed dates back more than 5,000 years to predynastic times–as does the Egyptian Book of the Dead which identifies the Djed as both the backbone of Osiris and the support and backbone of the universe. The Djed, however, is more than just an object; it is a mythic complex that existed long before Osiris emerged from the dark realm of the collective unconscious. Historically, the Djed was raised at crucial transitional times between cycles, evoking light and stability to dispel darkness and disorder. Such periods were the Winter solstices, the failing years of a reigning monarch or the coronation of a new one. However, according to the texts of the Temple of Horus at Edfu, the Djed served its greatest purpose and revealed its greatest mystery at the ending of one world age and the beginning of another. This is such a time! The Djed is the supreme unifying symbol of all polarities, connecting us to the transcendent reality of the whole, the One. It symbolizes the macro and microcosmic “axis.” As the cosmic axis the Djed is the “cylinder,” the column of light linking the Earth to the pole star. It represents stability because it aligns the North pole of Earth with the the still-point of the revolving “dome” of the heavens–the pole star. Beyond the pole star were/are the realms of the “gods” and higher dimensions of being. In the microcosm within us the human axis is the spinal column, the time-tunnel of the transformative journey from the gross materialism of homosapiens to the self-realization of homochristos at the crown chakra. It is through this chakra that we, too, are aligned with the energies of the pole star. Seti I, the second king of the 19th Dynasty was the son of Rameses I and Queen Sitre. He reconciled with the Hittites who were becoming the most powerful state in the region. 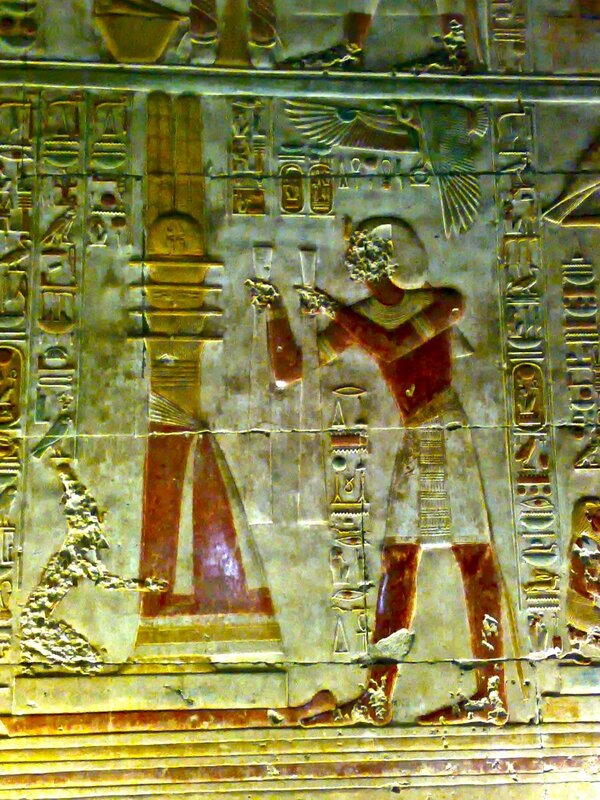 Seti I and his heir, Rameses II campaigned against Kadesh. He built his vast mortuary complex at Abydos. As you can see from the photos below the images are in sunk relief (front of temple) and bas relief (internal). These are some of the most beautiful and well preserved in the country. The entry to the Osirion contains many initiatory rights as hieroglyphs depicting ascension. 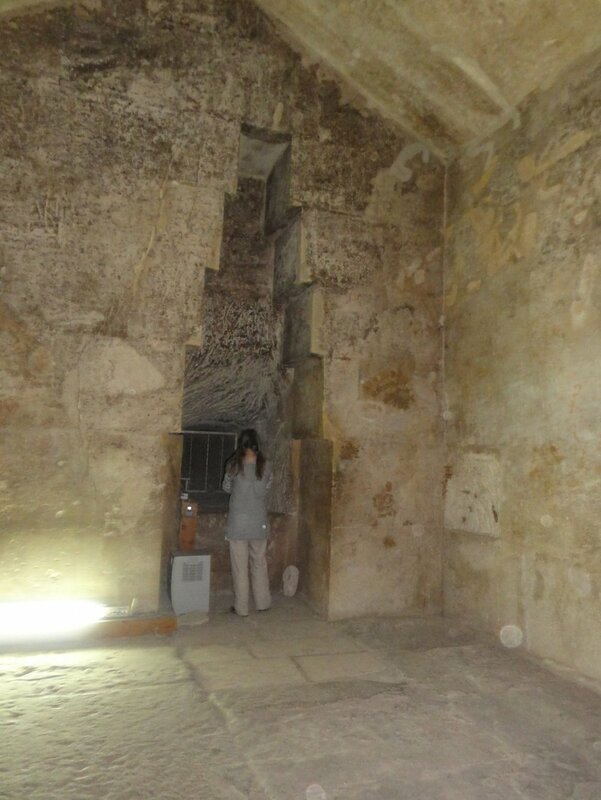 The antechamber opens into the Osirion where the large blocks are found. The staircase of the temple of Seti I at Abydos leading to the terrace and the Osirion bears an address in 43 columns of the goddess Seshat to the king (KRI I, 186-188). The text displays a rigid scheme which deals with the temple itself and its two groups of occupants (the king and the gods). Seshat demonstrates that the three main elements, temple, gods and king, have each their proper place in the sophisticated and complicated structure of the text. The address consists of three parts. The first concerns the temple, its conception and its realisation. The second presents the gods who live there and guarantee its sacred nature. The third part is devoted to the king who certifies its functioning. This last part has a very intricate structure, with reference to the Horus and solar aspect of the king, the Osirion aspect, and the relationship between the two. At the conclusion of the address Seshat speaks, in order to fulfil her usual task of registering the divine kingship of the pharaoh as living Horus, according to the orders of Re and the decree of Atum. There are something called “tenets” – which were the basic “Tenets of Original Wisdom” that have been handed down through the ages. These tenets have become distorted and blended together in many other teachings to the point that they are almost unrecognizable as the original tenets. There were Temples of Direct Experience, about which we’re speaking now, which allowed the initiates the highest levels of personal mastery. Once that was accomplished, there were Temples of Knowledge of which Abydos and the Osirion complex are very good examples. The presently standing complex at Dendera marks the location of a very old holy place. An indication of the antiquity of the temple site is given by the astronomical alignment of the main temple to Gamma Draconis before 5000BC. Dendera was the chief place for the worship of Hathor, who is variously seen as the patroness of earthly love, the goddess of healing, and the great feminine source of all nourishment (like the Hindu goddess Kali, Hathor also has her terrible aspects; in one ancient myth she is a raging lioness sent to punish mankind for its rebellion). It was a venerated place of pilgrimage where miraculous cures were effected by the goddess; it was a sort of hospital where various physiological, psychological and magical therapies were practiced; and it was the scene of great processions and festivals throughout the astrological cycle. 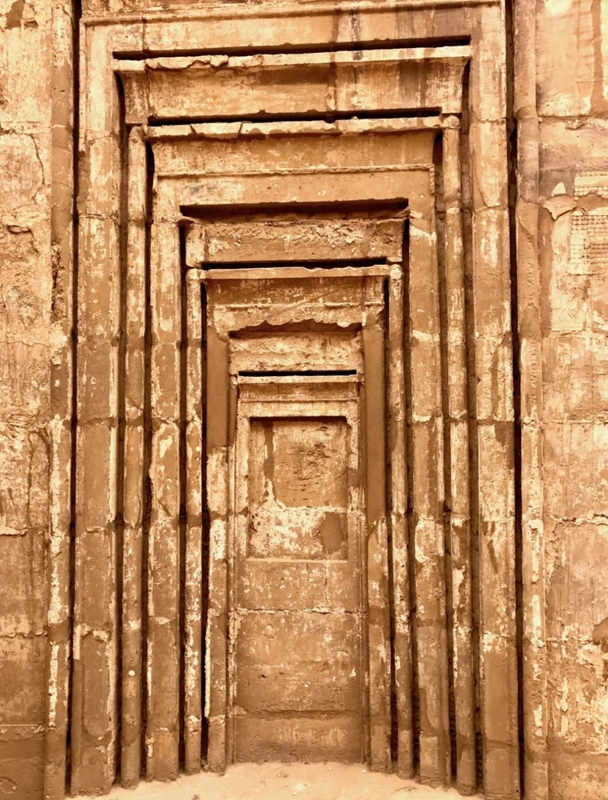 A feature of Dendera not found elsewhere in Egyptian temples are the dozen mysterious crypts, some underground, some enclosed within the massive double walls of the upper temple. It has been suggested that these crypts were the dwelling place of the goddess, where her statue and ritual objects were kept, and where began the great New Year's processions celebrating the dawn of creation. In the dark of night, the temple priests brought the statue of the goddess from the crypt, through the corridors of the enormous temple and, ascending to the roof, awaited the coming of the dawn. As the first rays of the morning sun broke upon the horizon, the statue was unveiled. Ancient texts speak of this ceremony whereby: "the goddess Hathor might be united with the beams of her father, Re" and that "the sky rejoices, the earth dances, the sacred musicians shout in praise." 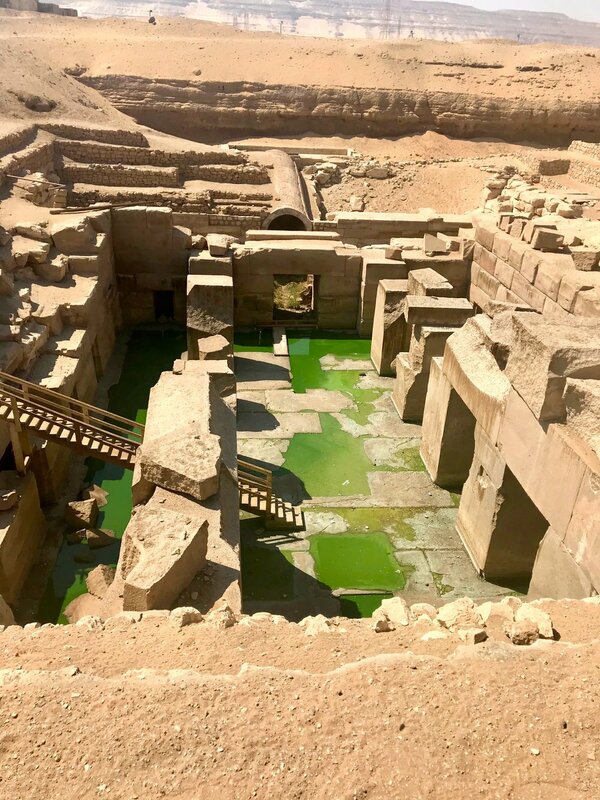 Enclosed within the precincts of the Dendera complex are a sacred lake, a temple of the goddess Isis, and a brick sanatorium where divine healing was practiced. 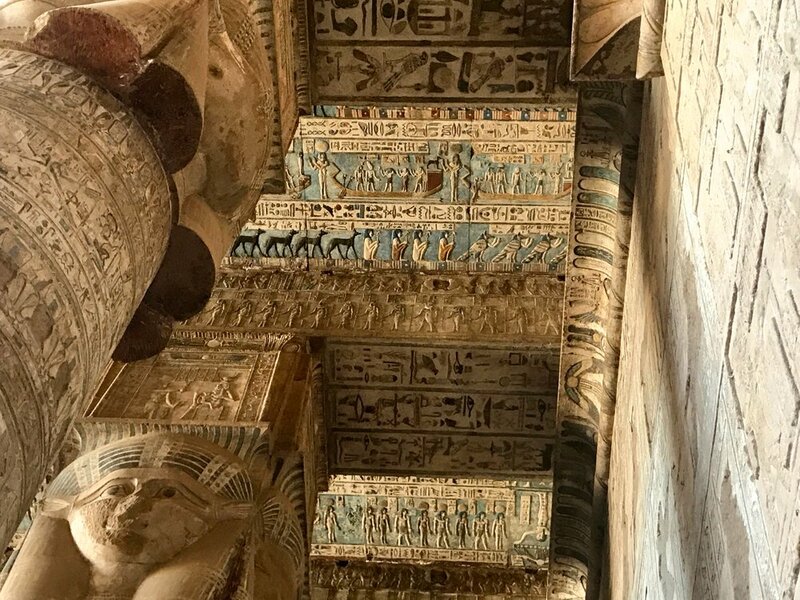 Below are photographs of the columns and ceiling of the forecourt to the Temple, stairs used by the priests to bring statuary from the crypts to the roof, chapel of Nut with beautifully decorated ceiling, chapel of Isis, Sacred lake, relief of Sekhmet in the Crypt and chapel ceiling depicting the zodiac. In Upper Egypt, on the eastern bank of the Nile, stand the remains of the most extensive temple complex of the Dynastic Egyptians. The entire site was called Wast by the Egyptians, Thebai by the Greeks, and Thebes by the Europeans. A large proportion of the ruins of ancient Egypt are situated here, divided between the temples of Luxor and the temples of Karnak. The ruins of both these temple complexes cover a considerable area and are still very impressive. The principal feature in Egyptian social centres, and usually the only one to have survived, was the temple. Not a place for collective worship but rather a house of the gods, only the temple's priests and the high nobility were allowed to enter the inner sanctums. The temple did, however, act as a cohesive focal point for the local community, which participated in the numerous pilgrimage festivals and processions to the temple. In the complex there is an obelisk erected by Queen Hatshepsut (1473 -1458 BC). It is 97 feet tall and weighs approximately 320 tons (some sources say 700 tons). An inscription at its base indicates that the work of cutting the monolith out of the quarry required seven months of labor. Nearby stands a smaller obelisk erected by Tuthmosis I (1504 - 1492 BC). It is 75 feet high, has sides 6 feet wide at its base, and weighs between 143 and 160 tons. 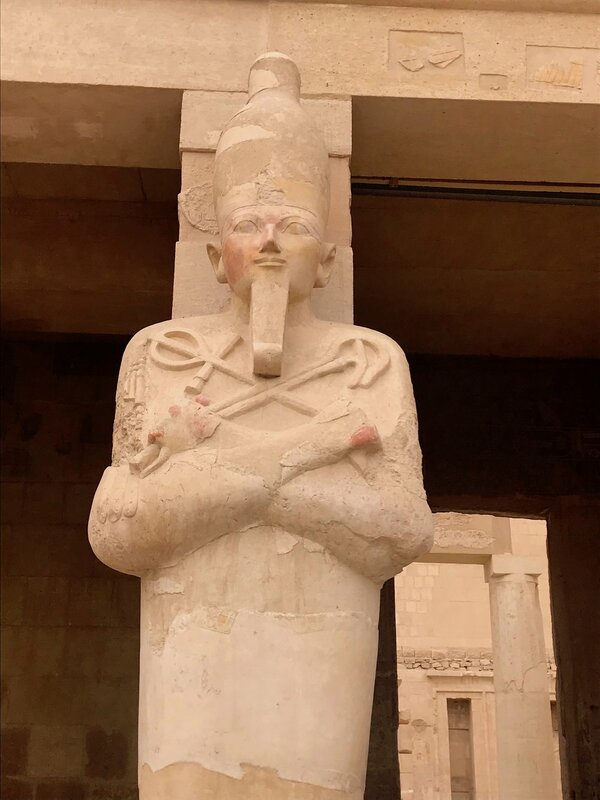 Hatshepsut raised four obelisks at Karnak, only one of which still stands. The Egyptian obelisks were always carved from single pieces of stone, usually pink granite from the distant quarries at Aswan, but exactly how they were transported hundreds of miles and then erected without block and tackle remains a mystery. Of the hundreds of obelisks that once stood in Egypt, only nine now stand; ten more lay broken, victims of conquerors, or of the religious fanaticism of competing cults. The rest are buried or have been carried away to foreign lands where they stand in the central parks and museum concourses of New York, Paris, Rome, Istanbul and other cities. The use of the obelisks is even more of a mystery than their carving and means of erection. While the obelisks are usually covered with inscriptions, these offer no clue to their function, but are instead commemorative notations indicating when and by whom the obelisk was carved. It has been suggested that the erection of the obelisk was a gesture symbolizing the 'djed' pillar, the Osirian symbol standing for the backbone of the physical world and the channel through which the divine spirit might rise to rejoin its source. 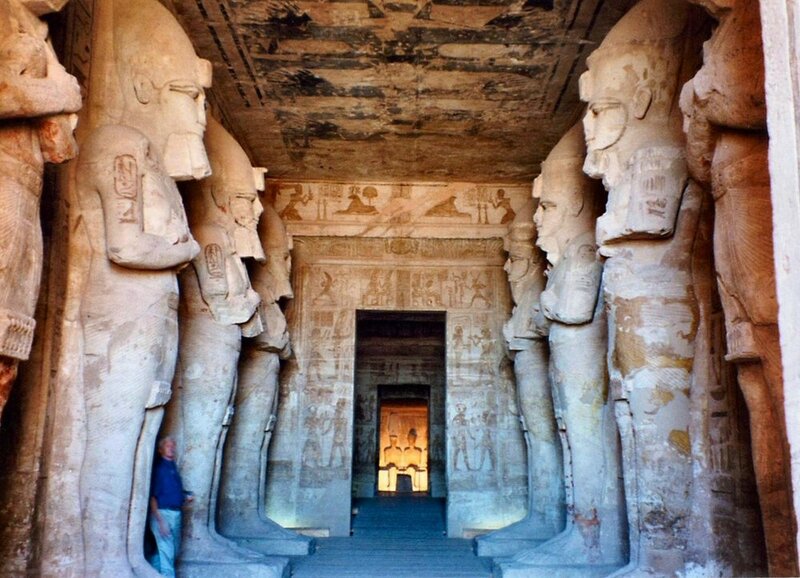 Below are photos of the main entrance to the Temple complex with avenue of Ram headed sphinxes, columns, central statue of Pharaoh Rameses II , Hatshepsut Obelisk, Sacred Lake, False Door, Seshat goddess of architecture, seven chakra door, chapel reliefs, Ptah god of the ancient city of Memphis. He was a creator god who brought all things to being by thinking of them with his mind and saying their names with his tongue. He was unique amongst Egyptian creation gods in that his methods were intellectual, rather than physical. 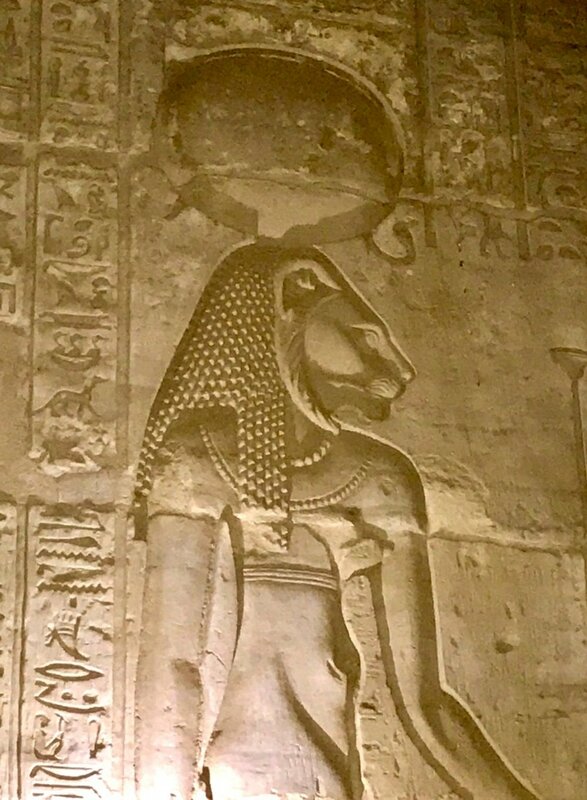 Sekhmet the lioness god is the wife of Ptah. In ancient times, Kom Ombo stood on an important crossroads between the caravan route from Nubia and trails from the gold mines in the eastern desert. During the reign of Ptolemy VI Philometor (180-145 BC), it became a training depot for African war elephants, which were used to fight the fierce pachyderms of the Seleucid empire. The temple at Kom Ombo was also built at this time, under Ptolemy VI. Since this bend in the Nile was a favoured spot for crocodiles to bask in the sun and threaten locals, it is natural that the temple would be dedicated to Sobek, the crocodile god. But it is unusual in having a double dedication: it also honours Haroeris, a form of the falcon-headed god Horus. The hypostyle halls were added under Ptolemy XIII (51-47 BC); the Roman emperor Trajan (53-117 AD) added the forecourt and outer enclosure walls. The ruins are of a temple the ancient Egyptians called Kom Ombo. It is here that one of Egypt’s most ancient of gods resides—Sobek. It is here, at Kom Ombo and the waiting crocodile-god, that neophytes desiring to become Initiates undertook a dangerous rite of passage. They had to jump into an underground chamber filled with water, and swim deep into a dark and murky pool to one of two openings. To make matters a little more challenging, the pool was home to actual physical crocodiles—hungry ones. One of the holes was pitch black, while the other radiated light. And the neophytes had to make a split second decision—swim to the light or swim into the dark. If they swam into the wrong opening, they would not have enough air to make it back to the top. Their initiation would end right then and there. If they didn’t die from lack of air, the crocs would get them. The right side is dedicated to Sobek-Re (the crocodile god combined with the sun god Re), along with his wife (a form of Hathor) and their son Khonsu-Hor. Sobek is associated with Seth, the enemy of Horus. In the myth of Horus and Osiris, Seth and his followers changed themselves into crocodiles to escape. The ancient Egyptians believed that by honouring the fearsome crocodile as a god, they would be safe from attacks. 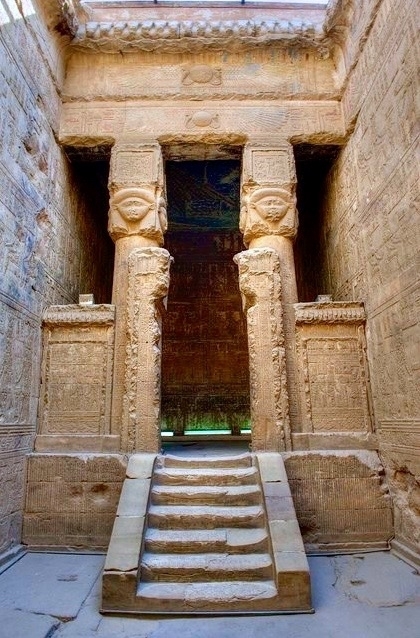 The left side is dedicated to Haroeris, the "Good Doctor" (a form of the falcon-headed god Horus the Elder) along with his consort Ta-Sent-Nefer, the "Good Sister" (another form of Hathor). Entrance to the temple complex is via the Gate of Neos Dionysos, only half of which still stands. On the outer wall on the left, Neos Dionysos is shown being purified by Thoth and Horus; on the right a similar scene occurs in the presence of Sobek (whose face has been destroyed). 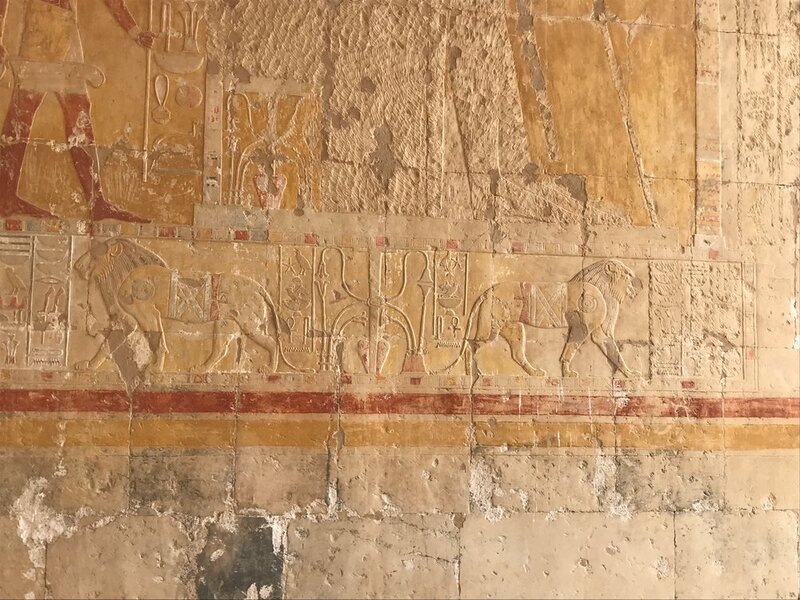 On the inner wall on the right (east) are especially fine carvings of Neos Dionysos being crowned before Haroeris, Sobek (patrons of the temple), Wadjet and Nekhbet (the goddess of the north and south). The west side of the inner wall has Neos Dionysos appearing before Isis, Horus the Elder, and a lion-headed god. In the back of the hall, the king makes offerings to the same deities. The Great Pyramid of Giza is the most substantial ancient structure in the world - and the most mysterious. According to prevailing archaeological theory - and there is absolutely no evidence to confirm this idea - the three pyramids on the Giza plateau are funerary structures of three kings of the fourth dynasty (2575 to 2465 BC). 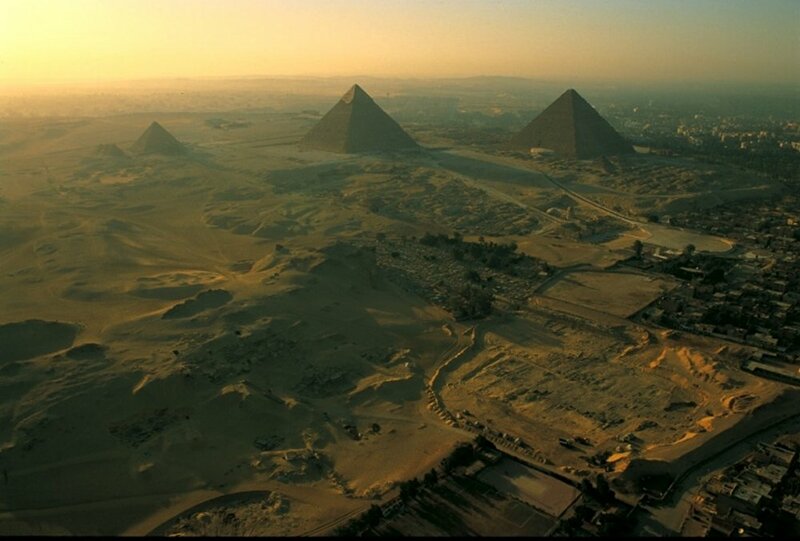 The Great Pyramid, attributed to Khufu (Cheops) is on the right of the photograph, the pyramid attributed to Khafra (Chephren) next to it, and that of Menkaura (Mycerinus) the smallest of the three. The Great Pyramid was originally 481 feet, five inches tall (146.7 meters) and measured 755 feet (230 meters) along its sides. Covering an area of 13 acres, or 53,000 square meters, it is large enough to contain the European cathedrals of Florence, Milan, St. Peters, Westminster Abbey and St. Paul's. Constructed from approximately 2.5 million limestone blocks weighing on average 2.6 tons each, its total mass is more than 6.3 million tons (representing more building material than is to be found in all the churches and cathedrals built in England since the time of Christ). The Great Pyramid was originally encased in highly polished, smooth white limestone and capped, according to legend, by a perfect pyramid of black stone, probably onyx. Covering an area of 22 acres the white limestone casing was removed by an Arab sultan in AD 1356 in order to build mosques and fortresses in nearby Cairo. Herodotus, the great Greek geographer, visited in the fifth century BC. Strabo, a Greco / Roman historian, came in the first century AD. Abdullah Al Mamun, son of the Caliph of Baghdad, forced the first historically recorded entrance in AD 820, and Napoleon was spellbound when he beheld the fantastic structure in 1798. 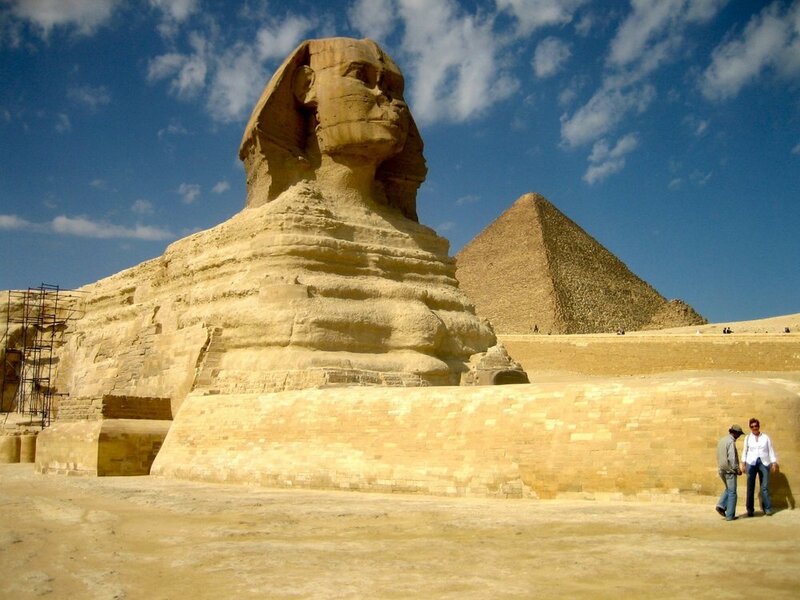 The Great Sphinx is a large human-headed lion that was carved from a mound of natural rock. It is located in Giza where it guards the front of Khafra's pyramid. The beginning of one story about the Great Sphinx is written on a stele between the sphinx's paws. The story reads that one day, a young prince fell asleep next to the Great Sphinx. He had been hunting all day, and was very tired. He dreamt that the Great Sphinx promised that he would become the ruler of Upper and Lower Egypt if he cleared away the sand covering its body (the Great Sphinx was covered up to its neck). The rest of the story is gone, so you will have to use your imagination to work out the ending. 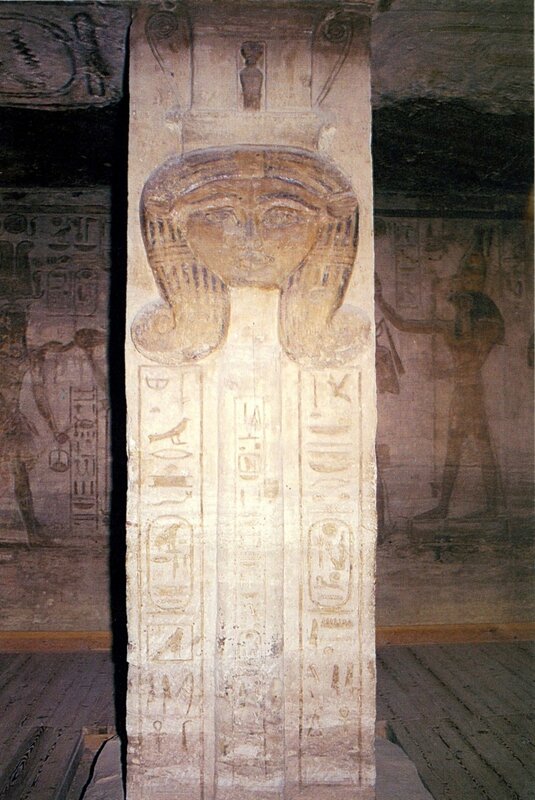 This stele was erected by the pharaoh Thutmosis IV who lived around 1400 B.C. The Temple was dedicated to the goddess Isis, the wife of Osiris and mother of Horus. These three characters dominate ancient Egyptian culture and their story possesses all the drama of a Shakespearian tragedy. The god Osiris is murdered and dismembered by his brother Seth. Isis searches for the fragments, collects them together and with her magic powers brings Osiris back to life. They then conceive the god Horus. Osiris becomes god of the under world and judge of the dead – who must answer to him for their deeds on Earth. Meanwhile Isis gives birth to Horus and protects the young god. Later when Horus is grown he avenges his father by defeating Seth in combat. 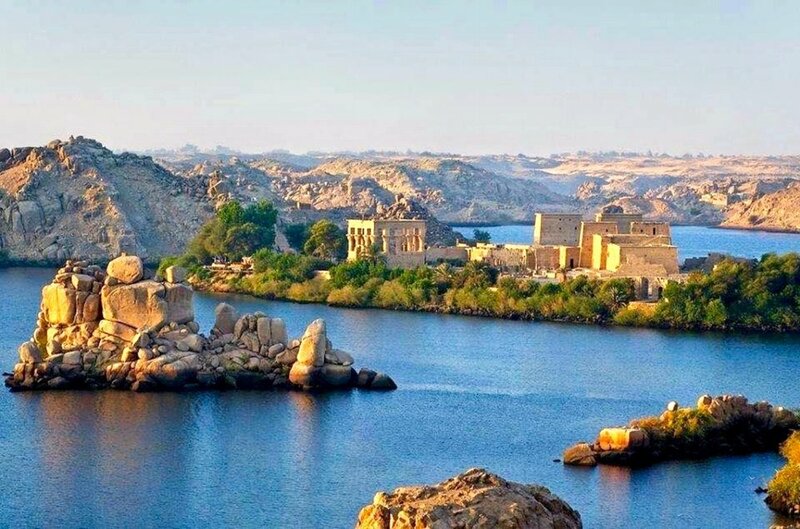 The temple at Philae was nearly lost under water when the high Aswan dam was built in the 1960s. Fortunately the temple was rescued by a joint operation between the Egyptian government and UNESCO. In an engineering feat to rival the ancients the whole island was surrounded with a dam and the inside pumped dry. Then every stone block of the temple complex was labelled and removed later to be assembled, like a giant jigsaw puzzle, on the higher ground of Agilka island. 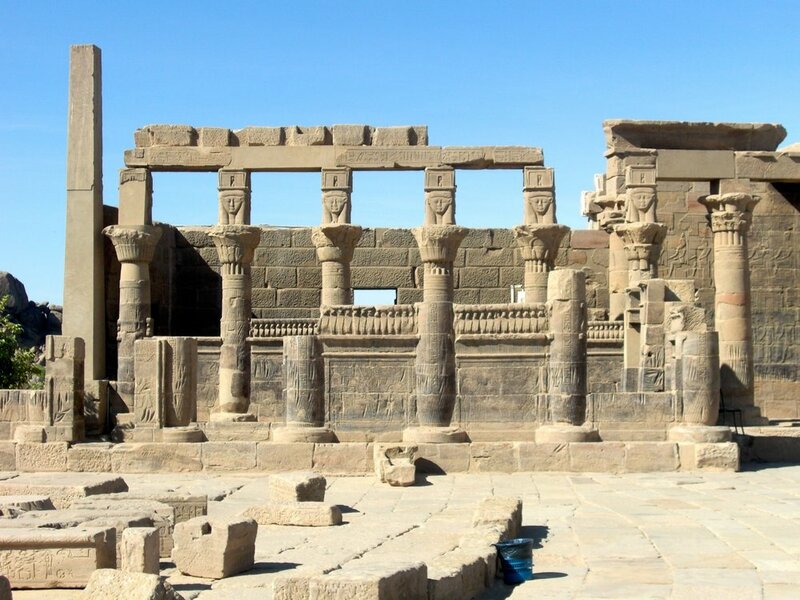 The whole project took ten years and has saved one of Egypt’s most beautiful temples from certain destruction. Our photos of the old gate are the only parts of the original temple and were not removed from their original site. Temple of Queen Hatshepsut on the West Bank of the Nile at Luxor. 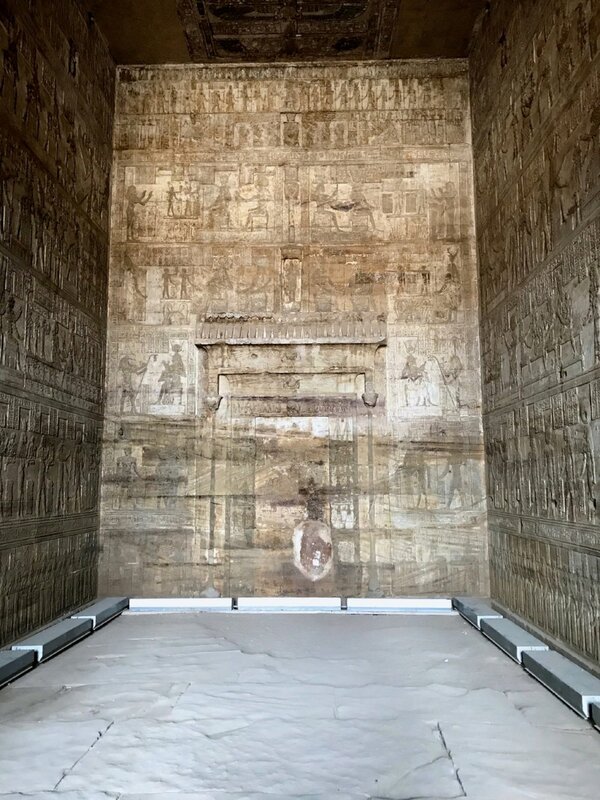 In the image above can be seen to the left a Chapel to Hathor and immediately beside it is the Punt Colonnade which tells the story of the Queen's expedition to Punt where she established trade between the Orient and Egypt. 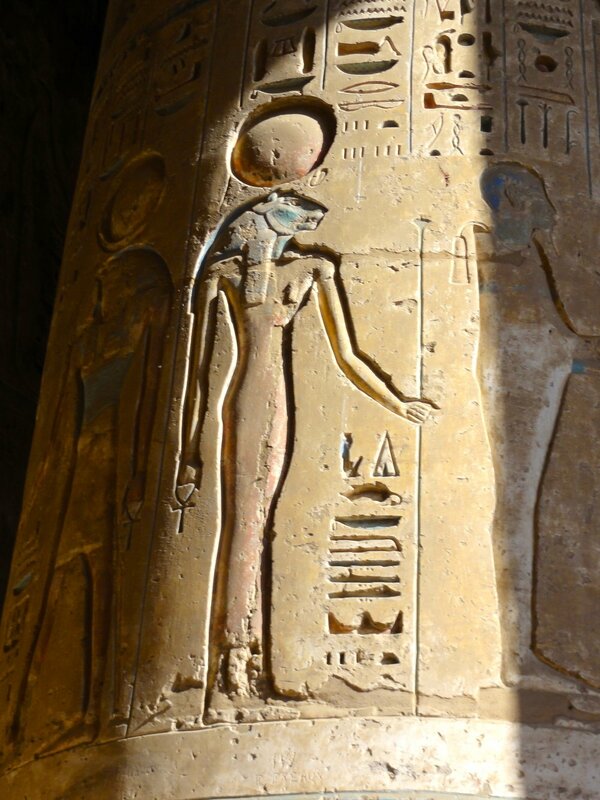 To the right is her Birth Colonnade with images showing of her Divine creation with the god Amun being her father. Further right is a Chapel to Anubis which is customary in all funerary temples in Egypt.